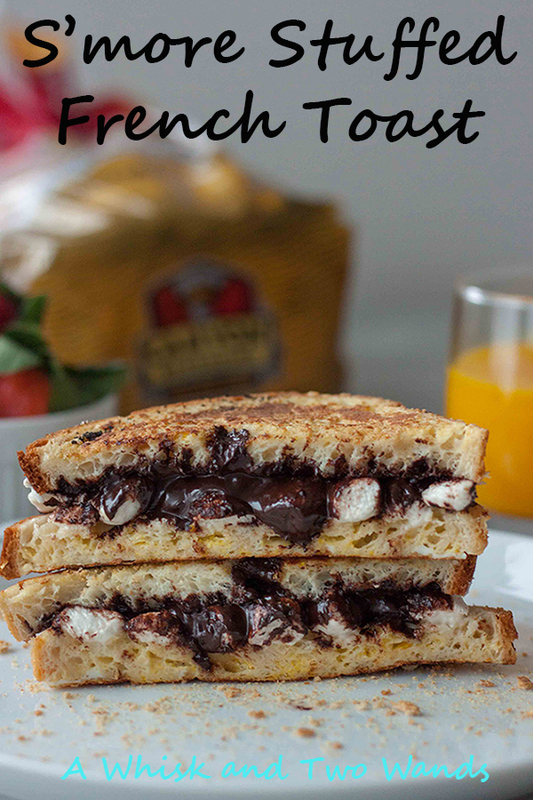 Today’s S’more Stuffed French Toast recipe is sponsored by my friends at Canyon Bakehouse! Thank you to them for making delicious gluten free bread and allowing me to share not only this recipe with you but also giving YOU the opportunity to try and share a loaf of their delicious gluten free with their Reunite A Friend With Bread Again Campaign. Yes it’s Monday but in our house we’re already thinking about Tuesday and Toast Tuesday! Bonus is this recipe is also perfect for Meatless Monday and if you’re into it or need a reason French Toast Friday. No matter what day of the week you make either of these s’more toast recipes, yes plural, it’s a good day! How can a day that starts with chocolate for breakfast not be a good day? We haven’t lost our minds over here eating chocolate for breakfast the second week into the year. There is a good reason why we created these combos and we are all about intuitive eating, plus there is a healthier and quick option but really both aren’t as bad as you might think just looking at it. This S’more Stuffed French Toast and Quick and Easy S’more Toast recipes were inspired by a little girl named Bella. While having any dietary restriction isn’t easy it’s even harder sometimes for a child. All the parties at school where you have to bring your own treat, going to friends houses, packing your lunch for school every day, the list goes on. 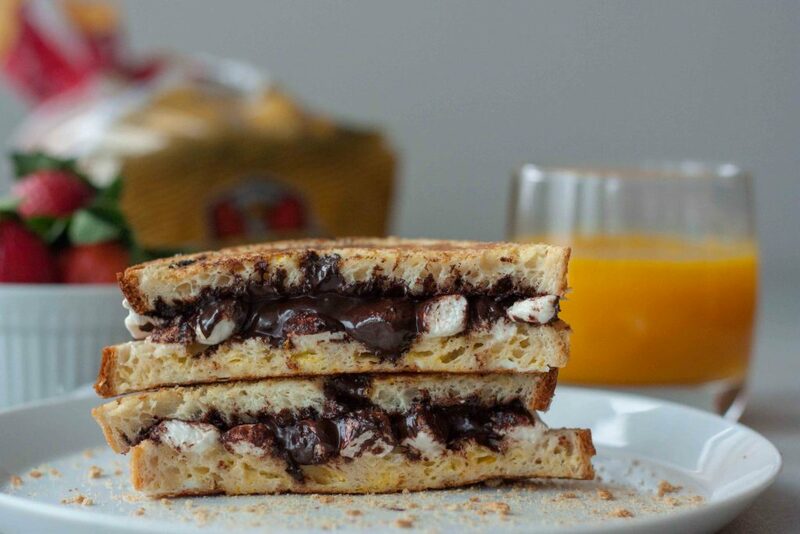 While Bella might not be able to have that treat at school she can have S’more Stuffed French Toast or Quick and Easy S’more Toast for breakfast! We had a few different recipes we tried and it came down to two flavor combos and s’mores won! Bella is a family friend and some of the girls favorite times with her are spent outside by the campfire and running around and just being kids outdoors. Everyone knows when you have a campfire you have to have s’mores! On mornings when you have a little more time S’more Stuffed French Toast is the way to go! 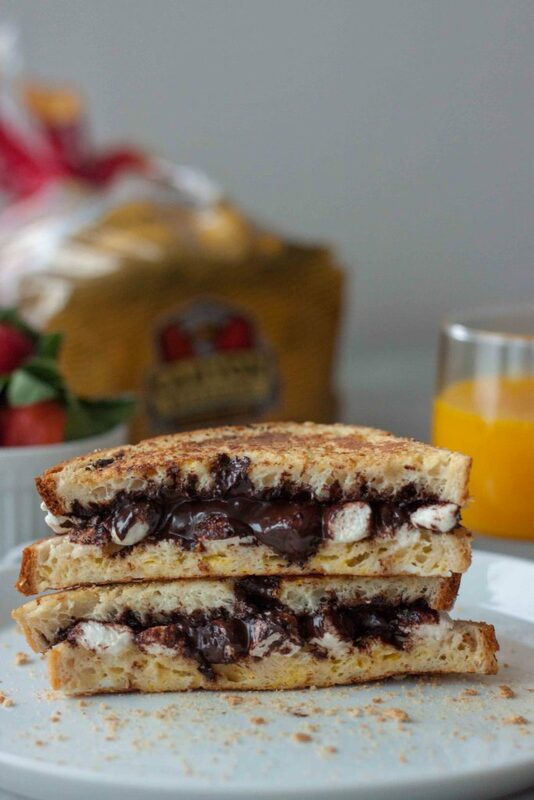 The ooey gooey melty chocolate and marshmallow goodness sandwiched between two graham cracker crusted slices of Canyon Bakehouse Mountain White Bread is so good it will make you say mmmm for sure! Our friend Bella is also dairy free so we used a dairy free chocolate hazelnut spread that also happens to 25% less sugar and 50% more protein than the leading brand of chocolate hazelnut spread. We found the Canyon Bakehouse Mountain White Bread makes a delicious brioche like French toast. Some mornings you don’t have as much time or maybe you want a healthier version and that’s where Quick and Easy S’more Toast comes in! 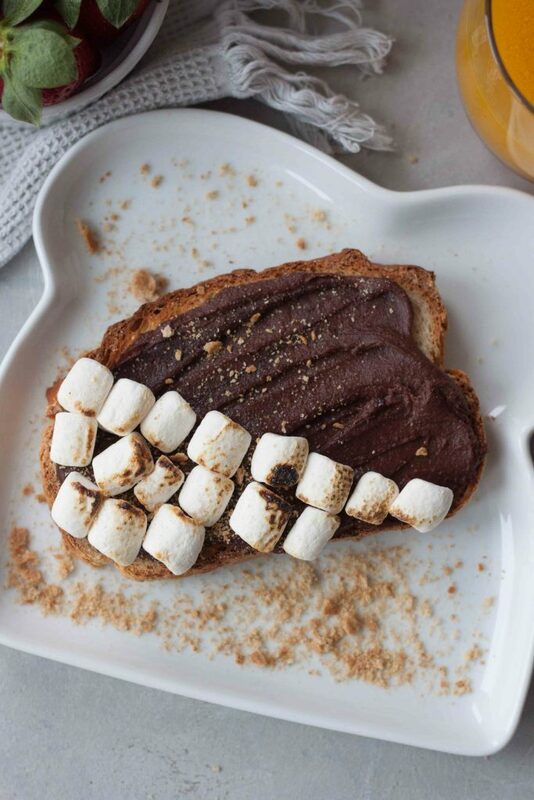 Quick and easy just toast your bread and top it with chocolate hummus, yes hummus, marshmallows which we like toasted but that’s optional, and sprinkle with graham cracker crumbs! If you are still questioning the chocolate hummus, try it, but if you are not a hummus person you can also use chocolate hazelnut spread the option is yours! We like to use Canyon Bakehouses’s new Heritage Style Honey White bread for toasting and sandwiches! Canyon Bakehouse has so many delicious gluten free bread options and for days when we don’t have our homemade bread we’re really enjoying their new Heritage Style Honey White Bread! I wish this bread was around when I was diagnosed with Celiac years ago, over 11 years ago, as it would have been a lot easier. Later being re-diagnosed with a gluten sensitivity years later, now making our own bread, and having yummy options from Canyon Bakehouse it makes things a lot easier. Now to the really good stuff! Yes the S’more Stuffed French Toast is good but free bread is really exciting too! Maybe you’re new to gluten free eating or you’ve been gluten free for years, my friends over at Canyon Bakehouse want to share a loaf of gluten free bread with you and a friend with their Reunite A Friend With Bread Again Campaign! Just head over to https://canyonglutenfree.com/bread/reunite-a-friend. You enter your friends name, pick a cute bread GIF, enter their email and your email, and that’s it. Canyon Bakehouse sends you and your friend an email, you enter your mailing address and they mail your coupon, your friend enters their mailing address and they get their coupon it’s that simple! The hardest part is going to be deciding what bread to try first, my vote is the their new Heritage Style Honey White! Their Mountain White is also makes yummy French toast (umm like S’more Stuffed French Toast) or they have new bagels in 5 flavors! If you get your loaf of Canyon Bakehouse and make something delicious I’d love to see it, tag me on social media and my friends Canyon Bakehouse, so I can try it out and maybe share your creations in my Insta Stories! All this toast and Toast Tuesday talk you’d think I’d forgotten about Monday, I wish some weeks, but no I know it’s Monday. My co-host Deborah and I look forward to seeing what you have cooking in your kitchen and hope you link up with us for Meatless Monday or share in the comments below. A morning that starts with gluten free S'more Stuffed French Toast is going to be a good day! Easy to make it's a real treat with healthier options and alternatives. Heat griddle or cast iron pan over medium heat. In a shallow dish whisk together egg, milk, and cinnamon. Take 2 slices of bread and spread each with 2 tablespoons of chocolate hazelnut spread. Spray griddle with non stick spray if needed, this will depend on your cooking surface. Dip the opposite side of bread with chocolate spread into the egg mixture and sprinkle with crushed graham crackers. Place bread with the egg and cracker mixture on the griddle and chocolate spread side facing up. Repeat with the other slice of bread. 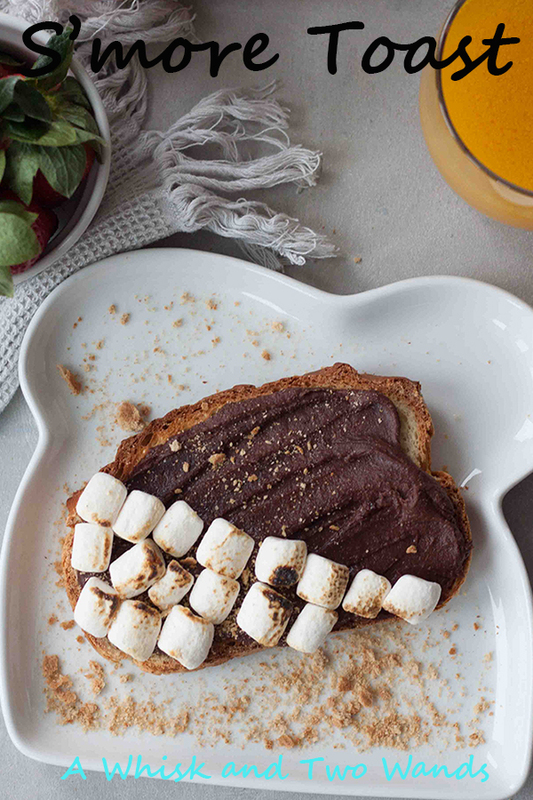 Place marshmallows on top of the chocolate spread. Take the 2 remaining slices of bread and dip one side of each into the egg mixture and sprinkle with crushed graham crackers. Place the unsoaked side down on top of the marshmallows. Grill until golden brown, a couple of minutes, before flipping and grilling the other side until golden brown. *Alternatively you can assemble bread, chocolate spread, and marshmallows and dip the outside of the sandwich into the egg mixture. I find doing it in pieces to be easier, especially for little hands if children are making it. Carefully cut in half and enjoy! We use the Canyon Bakehouse Mountain White and can make 2 servings with 1 egg and 2 TBSP milk, if using bigger slices or a different bread you might need more egg mixture. If wanting to make with a flax egg you will need to add more milk. We like to use a thicker milk when using a flax egg. Gluten free S'more Toast is a quick and easy breakfast or snack that's a healthy treat! Made with either healthier chocolate hazelnut spread or chocolate hummus no reason you shouldn't have chocolate for breakfast! Toast bread, spread with hummus or chocolate spread, top with marshmallows and toast with a kitchen torch or carefully broil if desired, sprinkle with graham cracker crumbs. Like it, PIN it for later (both options)! 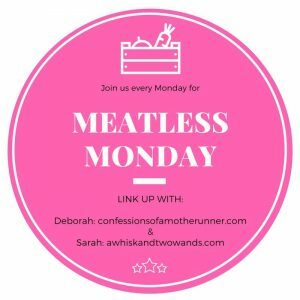 I’m also sharing the love and linking-up with Food, Pleasure and Health and The Fit Foodie Mama for #MeatlessMonday! Delicious and healthyish, sometimes you just need dessert for breakfast! I need that french toast ASAP! I’m not going to stop you from making it, haha! I’m even helping out by “giving” you the bread to make it! Yes we have been below 0 until this week, today we got up to 37F and it was like summer, so a cozy way to enjoy s’mores. What?! This looks soooo amazing! My s’mores loving daughter would most certainly enjoy this! Looks delicious! I know she would, my girls love it! YAY! I am *so* sending a friend some bread! 🙂 and then I’ll invite myself over to her house and we’ll make s’mores French toast! Such a great, I like the way you think! Good lord this looks amazing!! I don’t think Bella is going to miss any of the other sweets. How did you come up with this masterpiece?! Thank you! We got her the bread we are waiting on the chocolate spread to deliver it to her so she can make it! My family loves s’mores and so does Bella, inspiration is in the post. Holy moly, this looks insanely good! I’m obsessed with pretty much anything smores so I know I will love this recipe. I think you’d definitely love this recipe, hope you give it a try! That looks so decadently delicious. No doubt a crowd pleaser! Thank you Kelly! Nobody turned it down and were all smiles. You can make this ANY day of the week and a day that starts with this has to be a good one! Saved. Pinned. Done. Just gotta get marshmallows and this is mine! Hope you love it as much as I do, keep me posted! I’ve been craving sweets lately and this is perfect for my cravings! Haven’t had french toast in ages. This would definitely cure the sweet cravings! Now this is a breakfast that will have the kids running to the table! So fun and looks delicious! Yes, it’s a nice treat and using a lower sugar and higher protein chocolate hazelnut spread this mama approves (just not every day of course). I bet your girls would love it, and if you make it I want to see a picture of their reaction! Drooooling. I want this right NOW. Looks truly decadent and amazing! It works for dessert, just saying! You have just made my boys very happy!!! This looks delicious. I hope they love it as much as my girls! Would love to see their reaction ! Yes, please!! This breakfast would make me very happy!! It would start the day off on a very happy foot, just pair with coffee! This is my kid’s dream breakfast! I wish I could see all the kids reactions if their mama’s make it for them! Oh wow, this is just evil-y good Sarah! I love that bread, too. I’ll have to pick some up to make this -my husband would be in heaven! Alisa Fleming recently posted…The New ‘Eat Dairy Free’ Cookbook from Go Dairy Free is Here! Hey I used less sugar and more protein spread and it isn’t that evil! Gift and get a loaf and you can try it for free, great opportunity to try a new one! This is definitely going to give me a #momwin once my kids set their eyes on this Saturday morning! YES! If you make it for them you have to let me know what they think! Wish I could see all the reactions to kids waking up to it! My daughter likes smores. She would be shocked to find out we’re having them for breakfast. It might make her day, you’ll have to try it! I have been dreaming of this French toast ever since I saw it on Instagram! It will be the perfect special treat to make my son on a weekend – thanks for sharing! Yes definitely a treat! I wish I could see all the kids reactions to getting it for breakfast! I’m having to keep from drooling on my keyboard. These look delish! Sorry 😉 and thank you! Don’t you just hate having a snack/dessert that can be called breakfast, too? NOT!! These look yummy. Sounds like the perfect weekend splurge to me! Yes! There is the healthier option but the French toast is a treat, we like using a healthier chocolate hazelnut spread but still it is a treat. YES, it’s delicious and a great snack too! This idea is genius! 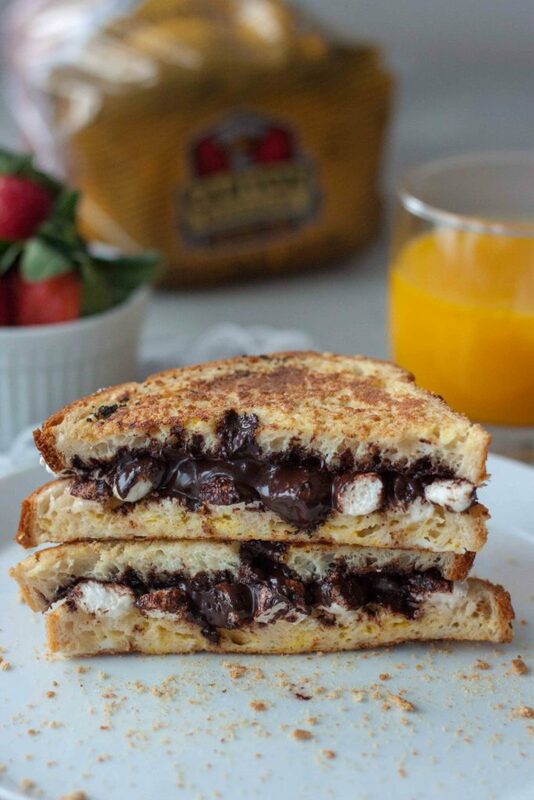 I can’t wait to make the stuffed s’mores french toast! These look so beyond delicious! What a combo, so great for a fun snack! This is something I don’t just want for breakfast, but for snack and all the time–it looks that good. My kids would flip for this breakfast! 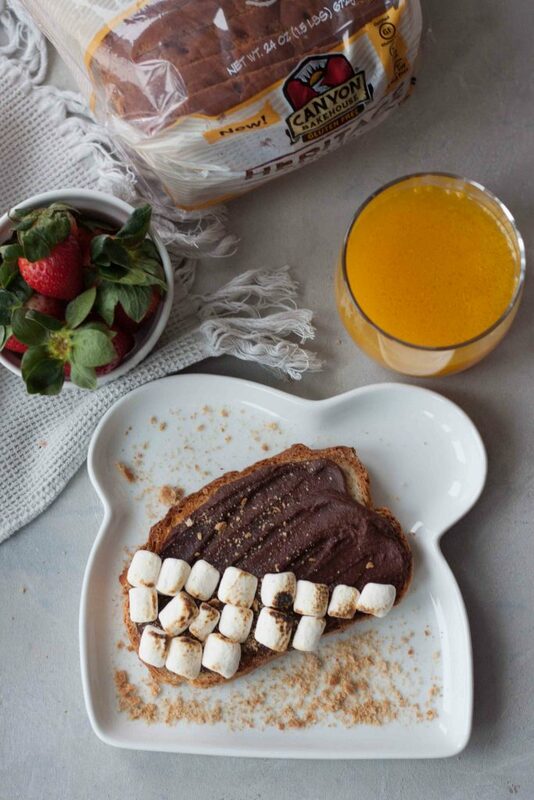 They already love smores and french toast, so bringing them together is a total mom win!